The Neighborhood Revitalization Club (NRC), an Upper School club that supports community development, recently received two awards for their work in the Baltimore neighborhood of Barclay. On December 9, students received a Certificate of Appreciation for their greening work in Barclay from the Barclay-Midway Old Goucher Coalition, a collection of community groups, non-profits, residents, businesses, and faith-based organizations focused on improving the quality of life in those neighborhoods. 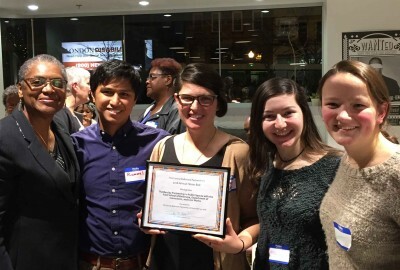 On December 14, the Central Baltimore Partnership also recognized the NRC with an Honor Roll Award, which recognized the partnership between the students, residents, and Civic Works' Community Lot Team to create a community garden out of vacant lots in Barclay. This coalition has worked together to design the garden, write grants, and navigate the construction process. About the club: In response to the unrest following the death of Freddie Gray in spring 2015, a group of students volunteered with the Community Lot Team of Civic Works. Soon after, they became interested in participating more fully in the process of transforming vacant lots into vibrant green spaces, turning again to Civic Works, and forming a group called the Neighborhood Revitalization Club. Members of the club began attending strategy meetings with Barclay residents, community organizers, and Civic Works. This larger collective focused its efforts on a series of contiguous vacant lots in Barclay, supporting the development of community green spaces and affordable housing. Photo: Park students receive the Honor Roll Award, pictured with Lottie Sneed, Barclay Community Builder of Strong City Baltimore, Park's Director of Civic Engagement Rommel Loria, and Jenny Katz, Greening Coordinator for Civic Works.